There's no denying that we're now in Autumn, both Halloween and Bonfire Night have been and gone, the clocks have fallen back and the leaves have turned. 'Tis indeed the season of mists and mellow fruitfulness. I reckon that those Danes and their Hygge may just be on to something. It's definitely time for hunkering down and cosying up with some comfort food. When we think of the changes in how we eat at this time of year it's most often soups and stews that spring to mind. However the Autumn brings with it a bountiful harvest of seasonal Cucurbita. No idea what I'm on about? Cucurbita is the Latin word for gourd which encompasses squash and pumpkins. Sadly there is a scary amount of Pumpkin waste at this time of year. Recent research found that two in five British households carve pumpkins for Halloween with most of these opting for at least two pumpkins, however only 33% cook the edible pumpkin that they carve out. We need to realise that pumpkins are a valuable source of food and not just for decoration. Despite their proliferation in the supermarket for Halloween it can be hard to find them at any other time, however Butternut Squash are available all year round and in the last couple of years I've been delighted to spot a selection of the smaller more colourful and unusually shaped pumpkins throughout the Autumn. 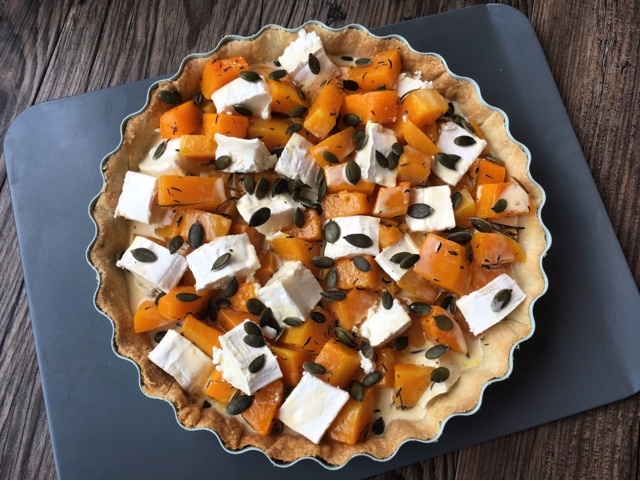 Today I've teamed squash with herbs and goats cheese for a fantastic vegetarian tart. I used a Jamie Oliver 25cm Loose base quiche tin to bake it in and the result is rather stunning if I do say so myself. The sides of the tin are higher than standard and the depth of the flutes gives a very professional finish. Made from carbon steel, rolled edges provide added strength and resistance from warping. There's a 25 year product guarantee and a 5 year non-stick coating guarantee and to top it off a gorgeous duck egg blue colour which matches my kitchen perfectly! When it comes to shortcrust pastry for a tart or quiche nine times out of ten I'll use shop bought. Are you shocked?! To be honest I'd rather spend my time making a fab filling than faffing around with pastry. 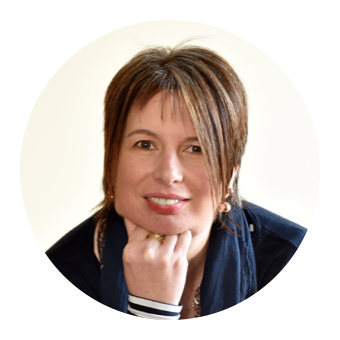 However I do have a few top tips to share that will help you line a tart tin whether you make your own or use ready made. Roll out your pastry to the thickness of a £1 coin. I find ready rolled a wee bit too thick for my liking so never use it straight from the pack. Keep things cool. Cold hands make the best pastry. Transfer the pastry to the tin by draping it over a rolling pin. Push but don't stretch the pastry into shape. Use a spare piece of well floured pastry, rather than your fingers, to push the pastry down into the corners and up the sides. No ceramic baking beans? Use pulses or pasta, just don't try to cook with them afterwards! Where time allows rest the pastry for 30 minutes in the fridge before baking. Place your tart tin on a sturdy baking tray that won't buckle in the oven. Bake your pastry blind before you trim off the edges to avoid shrinkage. Run a rolling pin lightly over the top in both directions to trim off the excess pastry. 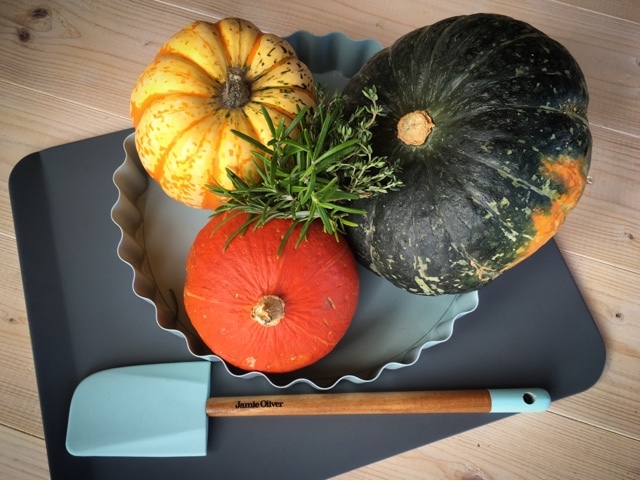 Armed with my top tips you'll be all set to create a showstopper of an Autumnal Tart! The only thing I'm slightly worried about is that I vividly remember being told in my Home Economics lessons that you should use a plain tart tin for savoury bakes and fluted for sweet. Perhaps I'm breaking a cardinal culinary rule?! Peel, de-seed and cube your pumpkin or squash and place it in a roasting tin along with the Garlic Oil, freshly ground Salt and Pepper, Thyme and Rosemary. Roast for 30 minutes, tossing halfway through. Remove any large thyme/rosemary stalks and the garlic cloves (if used). Line a 25cm Loose Base Quiche Tin with the shortcrust pastry. Bake blind for 10 minutes before removing the greaseproof paper and beans and continuing to bake for a further 5 minutes. Cut the goats cheese into cubes and arrange in the blind baked pastry case along with the roasted pumpkin/squash. Lightly beat the eggs, season with salt and pepper and combine with the cream. Pour the egg mix over the squash and cheese and sprinkle with pumpkin seeds. Reduce the heat on the oven to 180c and cook the tart for 20-25 minutes or until the top is golden brown and the egg mix has set. 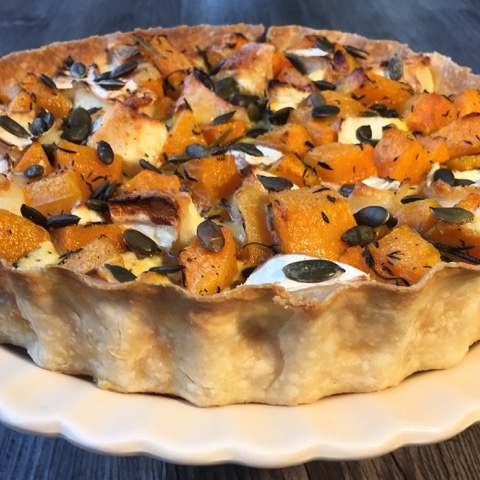 For more Vegetarian quiche and tart ideas check out Cathy's Spinach, Pea and Spring Onion Flan, Chris's Goats Cheese Tart with Mint Choclette's Three Allium Smoked Chilli Tart, Janice's Pea, Mint and Goats Cheese Quiche and my Greek Spanakopita Pie. Disclosure : This is a commissioned post for Jamie Oliver Bakeware. So sad about all the waste! This looks amazing and those chunks of goat cheese are calling my name. I love tarts! And squash and goat cheese together = brilliant! Thanks for sharing. This recipe has TWO of my most favorite things! Squash and goat cheese! I can't get enough of either! This looks delicious! Now that's a beautiful tart. Love the fall flavors you have going on. Delicious! This looks so interesting. Such a lovely crust too. 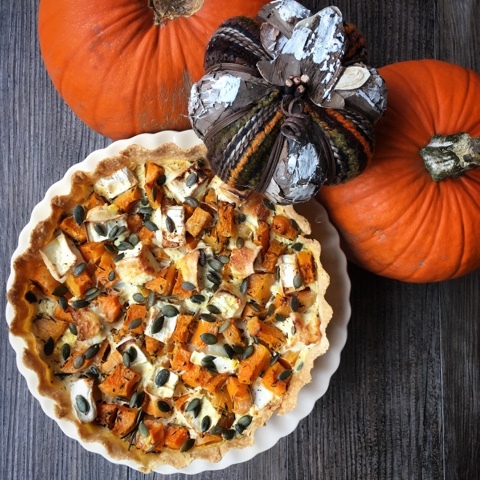 I love pumpkin in pretty much any form, but especially in a tart. That tin sounds perfect, you've produced a very attractive pastry and the filling - well, mmmm! This is my kind of tart, such perfect flavours. The tart tin looks like a fab one, it looks nice and deep to get lots of filling in. 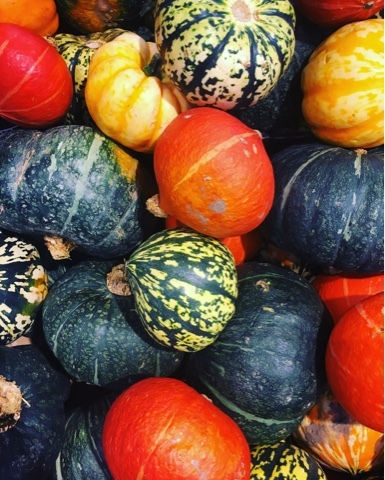 I love members of the Cucurbita family too, especially butternut squash and pumpkins! And they go sooo well with goat's cheese. This looks totally delicious! Beautiful finish on that crust - mine is never that neat. I have been making so many squash recipes recently must add this to my repertoire! Such a beautiful tart and I love how thin you've managed to get the pastry! Absolutely scrummy bake Claire, just perfect for this time of year. 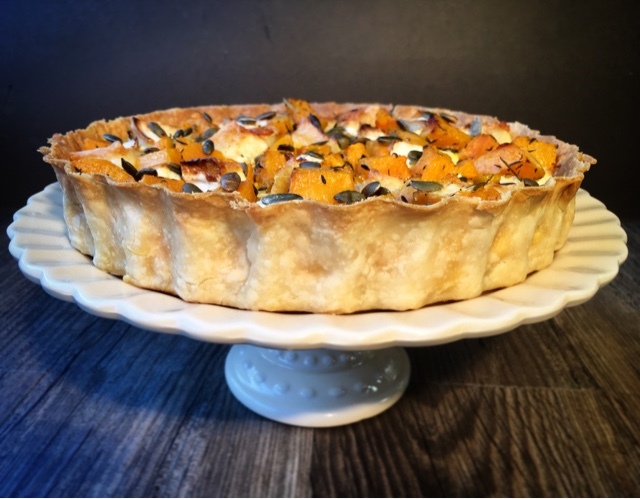 such a beautiful tart - the colours and flavours of autumn all wrapped up in pastry! I would love to try a slice please!